You will be automatically added to the list, which remains strictly confidential and used only for sending information about Voix du coeur (Heart's Voice). Thank you! Chantal Drapeau, in search of her true Self, has been experimenting with Self-expression through different creative venues for over 30 years as an artist, workshop facilitator and independent filmmaker. The Art of improvisation, a source of inspiration for her artwork, films and workshops, led her to train in the United States with Music for People, directed by (among others) David Darling, a cellist and exceptional musical improvisation teacher. During a four year training period in the « Musicianship and Leadership Program », Chantal trained with Dr. Jim Oshinsky of Music for People, who introduced her to vocal improvisation tools such as « toning », an ancient technique. She gained a newfound strength in her voice, which showed her the healing power that sound has on the body at the physical, mental and spiritual levels. She discovered her voice, her authenticity, a connection with herself for which she had sought in all her previous creative endeavours. She became aware that Self-expression using vocal improvisation, which emerges from listening to silence and breath, is an extraordinary way to connect to Self, and accessible to everyone. At the same time, Chantal further developed her voice with breath-sound work. During a three and a half year period she studied with Murielle Matteau, singer, voice and singing teacher, as well as Daniel Ladouceur, mentor and consultant of Option Process. Both are teachers of breath-sound work, trained by Serge Wilfart, and founders of the Option-Voix Centre in Montreal. Through the Option-Voix method, Chantal developed an awareness of deep breath, the power in the hara that radiates throughout the whole body and rebuilds « verticality ». She strengthened the capacity of her breath to support the expression of her voice, which became unveiled and clearer. Subsequently, she discovered « The Naked Voice », founded by Chloë Goodchild, international singer, innovative voice teacher and woman of compassion. « The Naked Voice » is a ground-breaking method that explores the human voice, both in speaking and singing, as a source of individual and collective Self-discovery, connecting to the deepest levels of human wisdom. Chantal’s Voice guided her to « The Naked Voice » and for several years she travelled to England for training (offered by Chloë Goodchild and her team, Masashi Minagawa, Shintaido master, and Nicolas Twilley, world percussionist-poet). She became a Facilitator of « The Naked Voice » in 2012. Chantal has experienced an inner transformation of consciousness with « The Naked Voice », by listening profoundly to the silence beyond thought, where love’s presence is revealed, this flow of life-energy within us that resonates in harmony with Life. She feels intimately connected to the oneness that is within each of us. It is a discovery process revealing her naked voice, her true nature beyond personal history, beyond judgement and conditioned thought. Inspired to share her experiences, Chantal has developed a unique approach of Self-expression. 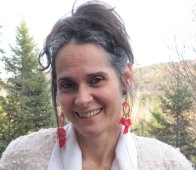 Since 2003, she has offered individual and group vocal improvisation workshops in Val David, situated in the magnificent Laurentian region of Quebec, through Musique du Coeur (Music from the Heart), which, over the years has transformed and become Voix du Coeur (Heart’s Voice). In a sacred space, Chantal enables participants to connect with themselves through deep listening to silence, breathwork, transformative sounds, and experiencing the field of awareness beyond conditioned thought. And so, in this space, the Heart’s Voice is revealed, singing a sacred improvised song through us that resonates in harmony with Life, with the oneness that is within each of us. It is a profound moment of Self-discovery with the Heart’s Voice. As part of the international community of The Naked Voice, Chantal is a representative for the work of The Naked Voice in Quebec.